Kunefe. 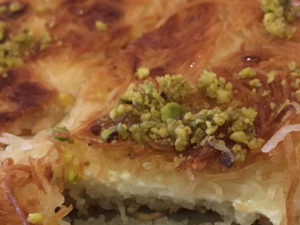 A heavenly cheese, pistachio pastry. Great atmosphere. Highly recommended: Iskender Kabob: Thinly sliced gyro beef topped with tomato and yogurt sauce. Served with huge portions of grilled veggies.